Château Le Paluel is a famous French ruin that has been ruined for years after being destroyed by Nazis in the Second World War – but it could soon be returned to glory, and you could play a part. The castle was originally built in the 15th century, and remained in good condition until the war. Now, however, it’s a crumbling ruin – but a crowdfunding campaign might change all that. The Chateau was (accoring to a French report) burnt to the ground by the SS 2nd panzer division – the infamous ‘Das Reich‘ – who were retreating in 1944 following the D-Day landings. For many years it lay in ruins, owned by a French doctor named Jean Lassner who was a pioneer of anaesthesia. It’s history through those years is spotty: it was featured in a French film of 1968 called Le Tatoué, and the body of a drug dealer from Bordeaux was apparently discovered at the bottom of one of the castle’s wells in 1980. Following Dr Lassner’s death in 2007 it was sold on again – but with the present owners seemingly short of funds to repair it, and the authorities beginning to make threatening noises, a crowdfunding campaign has been set up. The aim is to raise €500,000 to save La Paluel, half of which will go to buying the castle, the other half of which will pay for repairs. 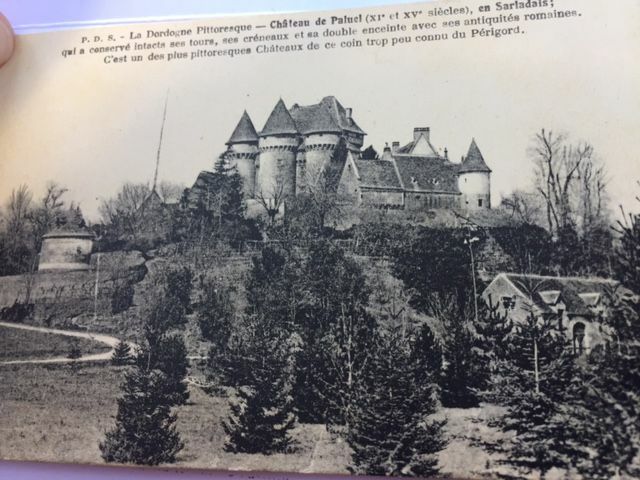 This pre-war image of the castle shared by francebleu.fr shows it in fine fettle. And if you’d like to get involved, pledges of €50 (that’s about £46) are being solicited in return for part ownership – one 10,000th – of the castle, on the understanding that you will not pay a single cent unless the funding target is reached. At the time of writing the organisers are about a third of the way to their target, with a few weeks left to go. As romantic as the idea sounds, however, we’d urge caution. Frankly, looking at the state of the place, that €250,000 repair budget could be swallowed up on scaffolding alone. Still, we suppose you’d probably have the right to camp in the ruins or its grounds, and that would be fun anyway (so long as the other 9,999 stakeholders didn’t all turn up on the same weekend). If you want to find more, then the ‘Adopte un chateau’ page (in French) with all the details is here. Bonne chance! Variety is the spice of life in France, with its cornucopia of landscapes and lifestyles open to property buyers. This magnificent French castle has a remarkably colourful history, as Desmond Seward explains.